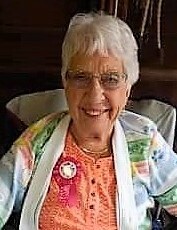 Elizabeth M. Napralla, age 91, of Markesan, formerly of Princeton, passed away on Tuesday, February 5, 2019, at the Markesan Resident Home. She was born on July 3, 1927, in Marquette County, the daughter of Ervin and Mabel (Wagner) Brieske. Elizabeth was the class president and valedictorian at Neshkoro High School in 1945. She met her future husband, Clifford Napralla, at a dance at the Princeton City Hall. On October 10, 1946, they were married at St. John's Catholic Church in Montello. They had been married for 69 years at the time of Cliff's passing on October 22, 2015. Liz worked as a phone operator in Milwaukee and then at Snitz Manufacturing in Princeton for many years. She loved spending time with her children, especially her grandchildren and great grandchildren, having them over for dinner and spoiling them with baked goods from grandma's kitchen. Liz enjoyed pan fishing, baking, cooking, crocheting, knitting, dancing, crossword puzzles and playing cards with family, friends and neighbors. Her favorite movie was Gone With The Wind. Those Liz leaves behind to cherish her memory include her 3 children, Warren (Kim Mashuda) Napralla of Montello, June (Pat) Connor of Neenah, Sharon (Randy "Bud") Doughty of Rhinelander; daughter-in-law, JoAnne Napralla; 6 grandchildren, Angela (Jason) Zills, Amy (James) Koehler, Cindy (Brad) Mlodzik, Mitch Napralla, Kelly (Nate) Lemmens, Karli Doughty; 8 great grandchildren, Jacob, Logan and Paige Zills; Alaina and Riley Koehler; Tyler Mlodzik; Cameron and Braydon Lemmens; many nieces and nephews; special friend, Marilyn Davison; other relatives and friends. She was preceded in death by her parents, Ervin and Mabel Brieske; daughter-in-law, Shari Napralla; grandson, Chad Doughty; husband, Clifford Napralla; son, Wayne Napralla. A Mass of Christian Burial for Elizabeth M. Napralla will be held on Monday, February 11, 2019, at 11:00 a.m., with visitation beginning at 9:00 a.m., at St. John the Baptist Catholic Church, 1211 W. Main St., in Princeton. Father Dale Grubba will officiate. Burial will follow the service in St. John's Catholic Cemetery in Princeton. Please visit our website www.wachholzandsons.com to send a condolence or to share a memory of Liz with her family.